Gaucher's disease (GD) is one of the most common lysosomal diseases in humans. It results from β-glucosidase deficiency and leads to necrosis, especially in macrophages with the accumulation of glucosylceramidase in cells. Most of the deleterious effects of the disease are seen in the liver, spleen, and bone marrow. The aim of this study was to compare the efficacy of Imiglucerase with Eliglustat in treating patients with GD. PubMed/Medline, Cochrane Library, Scopus, Web of Science, Embase, and Google Scholar were searched from inception to August, 2018. Predefined inclusion criteria for included studies were based on search methodology and are as follows: All randomized, quasi-randomized controlled, and cohort studies about patients with GD Type 1 that Imiglucerase was compared with Eliglustat were included. Two authors independently choose the papers based on the inclusion criteria. From 2979 recognized studies, three studies including two randomized clinical trials and one cohort study were recognized to meet the inclusion criteria. The primary outcomes were hemoglobin level, platelets count, liver, and spleen size, and the secondary outcomes were the immunological side effects of the medicines and bone complications. The results showed that there is no meaningful difference between the two medicines in terms of increasing blood hemoglobin, platelets count, and reducing the liver and spleen size. The findings of this review showed that both medicines are effective in the treatment of GD Type 1 and there is no statistically significant difference between their efficacies. Gaucher's disease (GD) is one of the most common lysosomal diseases in humans. It results from β-glucosidase deficiency and leads to necrosis, especially in macrophages with the accumulation of glucosylceramidase in cells., The risk of developing GD increases with consanguinity in the family. Its frequency varies with different populations being most prevalent at 1:45 birth incidence individuals of Ashkenazi Jewish descent. Evidences for efficacy of ERT and SRT in GD are unusually sparse. The recent development of new products such as Eliglustat, as an alternative for Imiglucerase, raise curiosity about biological benefits, and cost savings of it. The effectiveness of all ERTs and SRTs has been evaluated in the previous systematic review. As a result, assessing the role of Eliglustat as an alternative to Imiglucerase in treating patients with GD Type 1 by conducting a systematic review of published relevant studies seems rational. Hence, the aim of this study was to compare the efficacy of Imiglucerase with Eliglustat in treating patients with GD Type 1. The study protocol was submitted in PROSPERO website (http://www.crd.york.ac.uk/PROSPERO) with the registration number CRD42018093219. 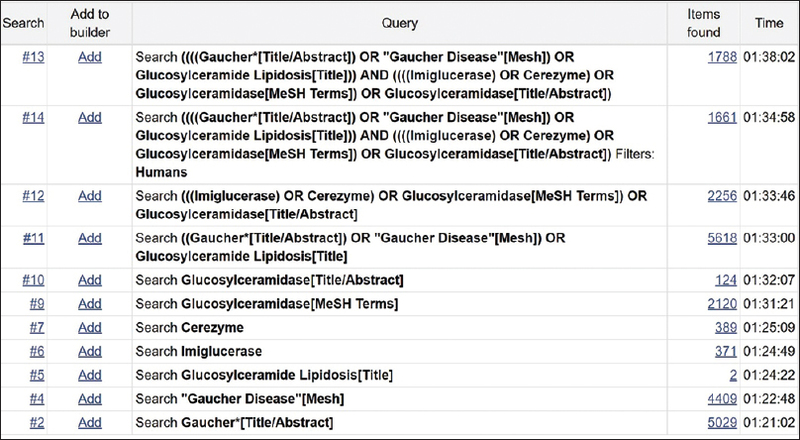 A systematic review of related texts was performed in Medline/PubMed, Cochrane Library, Scopus, Web of Science, Embase, and Google Scholar from inception to August, 2018 using selected MeSH terms related to the studied topic, including “Gaucher's Disease,” “Glucosylceramide lipidosis,” “Imiglucerase,” “Glucosylceramidase,” and “Cerezyme.” In addition, the list of references of the key studies and the review papers, which could have been overlooked in web search were scanned for more citations. Grey literature search was also conducted for unpublished sources. The studies were selected regarding predefined participants/intervention/comparison/outcome (PICO) for this review. All randomized, quasi-randomized controlled, clinical trials and retrospective cohort studies evaluating the efficacy of Imiglucerase against Eliglustat in patients (male/female) of any age with GD Type 1 were included in the review. The review was performed by completing the “defining a question and eligibility criteria” checklist. Imiglucerase (of any dose) was compared with Eliglustat (of any dose). The primary outcomes were including hemoglobin concentration, platelet count, liver size, and spleen size. The secondary outcomes were the immunological side effects of medicines and bone complications. The discovered studies were excluded from qualitative analysis if: (a) study population was GD Types 2 and 3; (b) study evaluate the efficacy of Imiglucerase and Eliglustat as combined therapy with other regimes; (c) study outcomes of the measure were not similar to ours; (d) it is conference abstracts, case reports, letters, reviews, or comments; and (g) study language was other than English. After dropping the repeated cases, two authors (A.N. and B.A.) reviewed the search results independently. First, the results were screened by their titles and irrelevant results were excluded. Second, the abstracts of the selected results were reviewed to eliminate conference abstracts, case reports, letters, reviews, or comments. Third, the full text of the chosen studies were reviewed separately. Then, the two authors held a face-to-face meeting to compare their results with each other. The differences between both authors were resolved through the discussion and mediation of the third researcher (M.D.). Finally, the requested data were extracted and summarized in the data sheet. The relevant data including the name of first author, publication date, place of the study, intervention, comparator, study design, sample size, follow-up period, and outcomes (hemoglobin level, platelet count, the liver, and spleen size) were presented in the tables. After primary analysis, it was clear that because of different metrics of the same outcome, dissimilar study designs, non-normality of data, we were not able to conduct a meta-analysis or a quantitative analysis. Therefore, a qualitative analysis of the data was conducted. Methodological quality was assessed independently by two authors according to the Cochrane Collaboration Handbook for randomized clinical trial (RCT) studies and Critical Appraisal Skills Program for cohort study. Likewise, the risk of bias within each included study was assessed based on the random sequence generation, allocation concealment, blinding, incomplete outcome data, and selective outcome reporting domains and reported with ratings of “low risk of bias,” “high risk of bias,” and “unclear” (uncertain risk of bias). Out of 2979 studies (1788 from PubMed, 84 from Cochrane Library, 462 from Web of Science [Institute for Scientific Information], 561 from Embase, and 67 from Scopus), 23 were qualified for the review in the first step. However, in the second step, twenty more studies were excluded based on the exclusion criteria. Finally, three studies were recognized to meet the inclusion criteria; two RCTs and one retrospective cohort study. The features of these studies have been shown in [Table 1] and [Table 2]. The flow diagram of the selection process has been shown in [Figure 1]. And electronic search strategy in PubMed database are shown in [Figure 2]. The risk of the incidence of possible errors in RCTs is summarized in [Table 3]. The details of randomization method had been described in the selected two RCTs and show that these studies had low risk of bias. Since the participants were taking an oral drug or intravenous Imiglucerase infusions, it was impossible to mask to the treatment allocation or blinding the participants. Therefore, these studies had a high risk of blinding bias in this stage. Nonetheless, since all components of the composite efficacy end-points were examined by central readers were masked, this risk of bias was handled appropriately. The bias of incomplete outcome data was unknown in both studies. The results showed that there is no meaningful difference between the two medicines in terms of increasing the hemoglobin level, platelets count, as well as in reducing the liver and spleen size. In the study by Cox et al., reducing the liver and spleen size were the same in patients treated by Eliglustat compared to those treated by Imiglucerase. The mean bone mineral density was in the normal range and maintained; mean bone marrow burden scores showed moderate infiltration of hemopoietin marrow and were also maintained. In a 12-month ENCORE trial, Pleat et al. found that Eliglustat was non-inferior to Imiglucerase in maintaining stability in adult patients who had reached stability by the administration of Imiglucerase or Velaglucerase. This post hoc analysis was studied safety and efficacy of Velaglucerase in 30 ENCORE patients. The patients were randomly divided into two groups; Eliglustat (n = 22) or Imiglucerase (n = 8). In this study, 90% of the patients who switched to Eliglustat and 88% of individuals who switched to Imiglucerase showed a stable hemoglobin level, platelet count, as well as liver and spleen size. The results showed that the mean baseline bone mineral density scores for both lumbar spine and femur were in the normal range. Likewise, the mean bone marrow burden scores were in the moderate infiltration range. The patients who transitioned from Velaglucerase alfa to Eliglustat had stable bone measures after 12 months. In the study by Ibrahim et al., parameters improved from baseline in both treatment groups, with a time course and degree of improvement in Eliglustat-treated patients were similar to Imiglucerase-treated patients. The outcomes of all included studies are summarized in [Table 2]. Among the evaluated Registry cohort of the patients, adverse event data were not recorded and sufficient data on bone were not available. Four serious adverse events including appendicitis, syncope, ischemic colitis, and uterine leiomyoma were also reported. All advers events were considered unrelated to treatment and none resulted in study withdrawal. The aim of this study was to compare the efficacy of Imiglucerase with Eliglustat in patients with GD Type 1. There are few randomized controlled studies, which compare Imiglucerase with Eliglustat. Moreover, they have insufficient sample size and short follow-up period, and they report inadequate therapeutic outcomes in people with GD1. However, all selected studies have concluded that Imiglucerase and Eliglustat are the same in terms of their effect on hemoglobin level, platelets count, as well as the liver and spleen size. The narrative review by Belmatoug et al. in 2016 showed that Eliglustat is effective in bone synthesis while Imiglucerase has little role in bone synthesis. Also, it was found that there is no difference between Imiglucerase and Eliglustat in terms of their effect on hemoglobin level, platelets count, as well as the liver and spleen size, which is the same as the findings of the present study. In 2014, a systematic review by Smid et al. demonstrated that Imiglucerase and Eliglustat are the same in terms of their effect on hemoglobin level, platelets count, as well as the liver and spleen size. In addition, it was found that Eliglustat is more effective in bone synthesis than Imiglucerase, which is supporting by our findings. The latest study published by Cox et al. in 2017 revealed that patients received Eliglustat for 4 years showed no serious side effects and the drug were well tolerated. Before early 1990s, when ERT was recognized as the exclusive treatment for GD “symptomatic treatment” (that is any medical therapy of a disease that only affects its symptom, not its cause) had been used with the support of many observational studies. Enzyme infusion improved the blood and visceral complications of the patients, and this improvement meaningfully enhanced their quality of life, in comparison with chronic patients. However, intravenous injection for people with hard-to-find veins and the long-term use of catheter for children could be troublesome. Generally, lifelong intravenous injection, high cost, and lack of entrance to the nervous system are the main limitations of treatment with ERT. SRT products have some advantages, which may make them superior to ERT. SRT minimizes the accumulation of excess material by inhibiting material synthesis. The biggest advantage of SRT is its oral administration, which makes it easier to cross the blood–brain barrier and reach other organs. The effect of Eliglustat on bone metabolism is another advantage of this agent over Imiglucerase. Although extensive knowledge about efficacy of Eliglustat are currently sparse, it is undeniable that the hematological and visceral responses of GD1 patients to Eliglustat are clinically related. However, since there was no direct and head-to-head comparison with sufficient sample size and lengthy follow-up period with treatment-nave study population that consist of sever patients with bone disease and splenectomies, it is not reasonable to state sharply that these results are exactly equivalent with Imiglucerase. Moreover, the potential effects of Eliglustat in long-term complications and its associated conditions need more investigation. For example in ENGAGE trial, only mild to moderate patients were included in the study and there was no results for sever patients. Furthermore, to predict CYP2D6 metabolizer status and to find appropriate dosing of Eliglustat, determination of the CYP2D6 genotype by testing a blood sample at a nationally accredited laboratory is essential. Eliglustat is approved in the European Union and Food and Drug Administration for adult patients who are predicted to be extensive, intermediate, or poor metabolizers. Eliglustat is not approved for patients in whom genotyping indicates CYP2D6 ultra-rapid and indeterminate metabolize since these patients may not reach adequate Eliglustat concentrations to achieve appropriate therapeutic effect. Nevertheless, Eliglustat interacts with drugs metabolized by CYP2D6 and it cannot be used in patients with heart, liver disease, kidney diseases, breastfeeding, pregnant women, and people above 65 years of age, This is important to not that there are no such restrictions for prescription of Imiglucerase. Although we performed an extensive literature search and consulted with the study authors to ensure that all the relative data were included and accurately interpreted, this review is nonetheless significantly constrained. There are few randomized controlled studies, which compare Imiglucerase with Eliglustat. Moreover, they have insufficient sample size and short follow-up period, and they report inadequate therapeutic outcomes in people with GD1. Although we did a quality assessment of studies, because of the limited number of studies, we did not meet our included criteria according to the quality of studies. In addition, as a result of small number of participants included in the study, the low quality of the methodology and inadequacy of information reported in the studies, as well as the difference in methodologies of the studies, it was impossible to conduct a meta-analysis or a quantitative analysis. Eliglustat is a very promising alternative for ERT with regard to its effects on hematological and visceral abnormalities. Currently, further investigations are needed to determine whether it is as effective in patients with severe disease, especially with symptomatic bone disease or whether it is safe in patients with polyneuropathy. Its superiority to ERT with respect to prevention of long-term complications and associated conditions needs further study as well. Frequently prescribed concomitant medications, which are metabolized by CYP2D6 and cardiovascular disease will probably restrict the prescription of Eliglustat. Azita Nabizadeh, Bahman Amani, and Majid Davari contributed in searching databases and extracted data from selected articles. Maliheh Kadivar, Akbar Abdollahi Asl, Mehdi Toreski, and Yahya Baiazidi contributed in the study concept and quality analysis of selected articles. Azita Nabizadeh, Bahman Amani, and Majid Davari contributed in quality analysis of selected articles. All authors contributed in manuscript preparation and final editing. This study was done as a PhD thesis project and was financially supported by Tehran University of Medical Sciences. Bohra V, Nair V. Gaucher's disease. Indian J Endocrinol Metab 2011;15:182-6. Grabowski GA, Andria G, Baldellou A, Campbell PE, Charrow J, Cohen IJ, et al. Pediatric non-neuronopathic Gaucher disease: Presentation, diagnosis and assessment. Consensus statements. Eur J Pediatr 2004;163:58-66. Sheth J, Mistri M, Sheth F, Shah R, Bavdekar A, Godbole K, et al. Burden of lysosomal storage disorders in India: Experience of 387 affected children from a single diagnostic facility. JIMD Rep 2014;12:51-63. Zimran A. How I treat Gaucher disease. Blood 2011;118:1463-71. Mistry PK, Weinthal JA, Weinreb NJ. Disease state awareness in Gaucher disease: A Q and A expert roundtable discussion. Clin Adv Hematol Oncol 2012;10:1-16. Barranger JA, Brady RO, Grabowski GA, Mankin H, Mistry PK, Weinreb NJ, et al. Position statement: National Gaucher Foundation Medical Advisory Board, January 7, 2014. Am J Hematol 2014;89:457-8. Koprivica V, Stone DL, Park JK, Callahan M, Frisch A, Cohen IJ, et al. Analysis and classification of 304 mutant alleles in patients with type 1 and type 3 Gaucher disease. Am J Hum Genet 2000;66:1777-86. Amaral O, Lacerda L, Santos R, Pinto RA, Aerts H, Sa Miranda MC, et al. Type 1 Gaucher disease: Molecular, biochemical, and clinical characterization of patients from northern portugal. Biochem Med Metab Biol 1993;49:97-107. Mistry PK, Cappellini MD, Lukina E, Ozsan H, Mach Pascual S, Rosenbaum H, et al. A reappraisal of Gaucher disease-diagnosis and disease management algorithms. Am J Hematol 2011;86:110-5. Barton NW, Brady RO, Dambrosia JM, Di Bisceglie AM, Doppelt SH, Hill SC, et al. Replacement therapy for inherited enzyme deficiency – Macrophage-targeted glucocerebrosidase for Gaucher's disease. N Engl J Med 1991;324:1464-70. Gonzalez DE, Turkia HB, Lukina EA, Kisinovsky I, Dridi MF, Elstein D, et al. Enzyme replacement therapy with velaglucerase alfa in Gaucher disease: Results from a randomized, double-blind, multinational, phase 3 study. Am J Hematol 2013;88:166-71. Grabowski GA, Barton NW, Pastores G, Dambrosia JM, Banerjee TK, McKee MA, et al. Enzyme therapy in type 1 Gaucher disease: Comparative efficacy of mannose-terminated glucocerebrosidase from natural and recombinant sources. Ann Intern Med 1995;122:33-9. Elstein D, Hadas-Halpern I, Itzchaki M, Lahad A, Abrahamov A, Zimran A, et al. Effect of low-dose enzyme replacement therapy on bones in Gaucher disease patients with severe skeletal involvement. Blood Cells Mol Dis 1996;22:104-11. Pastores GM, Weinreb NJ, Aerts H, Andria G, Cox TM, Giralt M, et al. Therapeutic goals in the treatment of Gaucher disease. Semin Hematol 2004;41:4-14. Weinreb NJ, Aggio MC, Andersson HC, Andria G, Charrow J, Clarke JT, et al. Gaucher disease type 1: Revised recommendations on evaluations and monitoring for adult patients. Semin Hematol 2004;41:15-22. Caudle KE, Klein TE, Hoffman JM, Muller DJ, Whirl-Carrillo M, Gong L, et al. Incorporation of pharmacogenomics into routine clinical practice: The clinical pharmacogenetics implementation consortium (CPIC) guideline development process. Curr Drug Metab 2014;15:209-17. Cox TM. Eliglustat tartrate, an orally active glucocerebroside synthase inhibitor for the potential treatment of Gaucher disease and other lysosomal storage diseases. Curr Opin Investig Drugs 2010;11:1169-81. Cox TM, Aerts JM, Andria G, Beck M, Belmatoug N, Bembi B, et al. The role of the iminosugar N-butyldeoxynojirimycin (miglustat) in the management of type I (non-neuronopathic) Gaucher disease: A position statement. J Inherit Metab Dis 2003;26:513-26. Radin NS. Treatment of Gaucher disease with an enzyme inhibitor. Glycoconj J 1996;13:153-7. Moher D, Shamseer L, Clarke M, Ghersi D, Liberati A, Petticrew M, et al. Preferred reporting items for systematic review and meta-analysis protocols (PRISMA-P) 2015 statement. Syst Rev 2015;4:1. Pai M, McCulloch M, Gorman JD, Pai N, Enanoria W, Kennedy G, et al. Systematic reviews and meta-analyses: An illustrated, step-by-step guide. Natl Med J India 2004;17:86-95. Higgins JP, Altman DG, Sterne JA, editors. Assessing risk of bias in included studies. In: Cochrane Handbook for Systematic Reviews of Interventions, Version 5.1.0. The Cochrane Collaboration; 2011. Available from: http://www.cochranehandbook. [Last updated on 2011 Mar 25; Last accessed on 2017 May 25]. Cox TM, Drelichman G, Cravo R, Balwani M, Burrow TA, Martins AM, et al. Eliglustat compared with imiglucerase in patients with Gaucher's disease type 1 stabilised on enzyme replacement therapy: A phase 3, randomised, open-label, non-inferiority trial. Lancet 2015;385:2355-62. Pleat R, Cox TM, Burrow TA, Giraldo P, Goker-Alpan O, Rosenbloom BE, et al. Stability is maintained in adults with Gaucher disease type 1 switched from velaglucerase alfa to eliglustat or imiglucerase: A sub-analysis of the eliglustat ENCORE trial. Mol Genet Metab Rep 2016;9:25-8. Ibrahim J, Underhill LH, Taylor JS, Angell J, Peterschmitt MJ. Clinical response to eliglustat in treatment-naïve patients with Gaucher disease type 1: Post-hoc comparison to imiglucerase-treated patients enrolled in the International Collaborative Gaucher Group Gaucher Registry. Mol Genet Metab Rep 2016;8:17-9. Belmatoug N, Di Rocco M, Fraga C, Giraldo P, Hughes D, Lukina E, et al. Management and monitoring recommendations for the use of eliglustat in adults with type 1 Gaucher disease in Europe. Eur J Intern Med 2017;37:25-32. Smid BE, Hollak CE. A systematic review on effectiveness and safety of eliglustat for type 1 gaucher disease. Expert Opin Orphanet Drugs 2014;2:523-9. Weinreb NJ, Barranger JA, Charrow J, Grabowski GA, Mankin HJ, Mistry P, et al. Guidance on the use of miglustat for treating patients with type 1 Gaucher disease. Am J Hematol 2005;80:223-9. Elstein D, Zimran A. Review of the safety and efficacy of imiglucerase treatment of Gaucher disease. Biologics 2009;3:407-17. Shayman JA. The design and clinical development of inhibitors of glycosphingolipid synthesis: Will invention be the mother of necessity? Trans Am Clin Climatol Assoc 2013;124:46-60. Cox TM, Drelichman G, Cravo R, Balwani M, Burrow TA, Martins AM, et al. Eliglustat maintains long-term clinical stability in patients with Gaucher disease type 1 stabilized on enzyme therapy. Blood 2017;129:2375-83. Mistry PK, Lukina E, Ben Turkia H, Amato D, Baris H, Dasouki M, et al. Effect of oral eliglustat on splenomegaly in patients with Gaucher disease type 1: The ENGAGE randomized clinical trial. JAMA 2015;313:695-706. Jung O, Patnaik S, Marugan J, Sidransky E, Westbroek W. Progress and potential of non-inhibitory small molecule chaperones for the treatment of Gaucher disease and its implications for parkinson disease. Expert Rev Proteomics 2016;13:471-9. Aflaki E, Westbroek W, Sidransky E. The complicated relationship between Gaucher disease and parkinsonism: Insights from a Rare disease. Neuron 2017;93:737-46. Ortega RA, Torres PA, Swan M, Nichols W, Boschung S, Raymond D, et al. Glucocerebrosidase enzyme activity in GBA mutation Parkinson's disease. J Clin Neurosci 2016;28:185-6. Migdalska-Richards A, Schapira AH. The relationship between glucocerebrosidase mutations and Parkinson disease. J Neurochem 2016;139 Suppl 1:77-90.